Rachel Maddow lowlights -- again, this isn't to be a fair and balanced piece about her career and achievements, you can listen to her or MSNBC, CNN or any progressive if you want to hear that claptrap. This is more about some of the many of reasons her detractors are not fans. 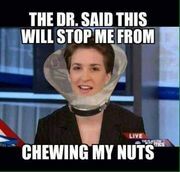 2019.04.01 Maddow v Alex Jones - Legal Insurrection asks why isn't Maddow treated like other crazy conspiracy theorists like Alex Jones. Which is actually unfair, as Jones is more moderate. Jones was de-platformed for his conspiracy theories (another leftist blacklist). But Maddow? She keeps her TV show and is given the gift of the double-standard. 2019.03.22 Mueller Report - The Mueller Report is out. I don't care if you like/dislike President Trump, I care whether people will defend the truth or perpetuate a lie. Soon we will be able to read the full report, but the summary is a smackdown: (a) there was no hint at collusion by Trump or his team, in fact they rebuffed attempts by the Russians. (b) without collusion there couldn't have been obstruction, but even if there had been, Trump wasn't close to obstruction (c) the media narrative has been a fraud (d) the media wasted 2,284 minutes, and 533,074 articles (245 million responses) to coverage of the fake narrative. The media doesn't admit their mistake and apologize to Trump and the public are not journalists following the facts, but polemics mad that someone shined the light of truth on their deception. And right on cue, a bunch of FakeNews, Democrat politicians, and Hollywood sheep try to spin this as it, "stops short of exonerating on obstruction", or shifting the narrative to Mueller's competence, Trump's guilt on something else, or anything other than their 2-year fraud. But all the outlets that championed it as the end of Trump, or shown for frauds. Expecially when they won't just apologize. 2019.02.05 Don Jr's Call Logs - For months Maddow inflamed her watchers with the FakeNews that Don Jr. was in contact with "the Russians"... then when the story is debunked, Maddow brings on the accuser (Shifty Shiff), has him repeat the claims, then fails to correct or challenge him or the record. No clarification, retraction or correction, just the FakeNews crickets, chirping distractions so her viewers clues die in darkness. She rants that Comey's firing is unprecedented, right before forgetting she said that the sentence before, and mentions Clinton's precedent in doing the same thing. Ooops. You can get facts and counter-balance out of MSNBC, but it's usually when the incompetently and accidentally mention it, like that one. This page was last edited on 1 April 2019, at 18:03.